Before the move we were in Oregon for Xmas. During the move we were exhausted. After the move we were busy running all over town finding things we needed for the new place. And after that … well, I have to write a novel this year. Upshot: I haven’t had a lot of time for writing rants and reviews and news of our life. But we have found the time to do some interesting things. In fact, I have quite a backlog of things I want to write about, but put off. So, when I can, I’m going to be filling them in and sending them out to friends and the mailing list, and posting them on the site. They won’t be in any particular order, but I’ll try to keep current with the new things. I still can hardly say the words “Los Angeles Subway” without laughing. Of all the cities in the world, why would you want a subway in LA? The weather here is gorgeous, it hardly ever rains (when it does, of course, houses slide off the hills), and we get these little “shake-ups” from time to time. Earthquakes, you’ve probably heard of them. But they got away with BART in the Bay Area, so why not? Actually, I did a little reading up on it, and it seems there was a debate for a long time. Many people favored an elevated train system, either monorail or rubber-tired trains like they have in Montreal and Mexico City. It would seem to me this would have been cheaper. Instead of long, long tunnels, which have to be hugely expensive to dig, why not erect a series of concrete posts, string concrete rails between them, and viola! Plus, you’d get to see them zip by as you’re sitting there in your gridlocked car, and think about riding them. But who asked me? Anyway, they built it, it’s called the Red Line, and it runs from Union Station downtown out to North Hollywood. 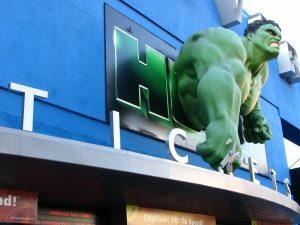 The Hollywood Boulevard/Western Avenue station is two blocks from our apartment. The fare is $1.30 one-way (you can get on and off, there is no fare box) or $3 for an all-day pass on all trains, which includes the Blue Line to Long Beach and the Gold Line to Pasadena, both surface trains that run along old RR right-of-ways. There is a two-station extension along Wilshire Boulevard and they intend to take it all the way to Venice or Santa Monica one of these days … if they can figure out if it’s safe to tunnel through the Miracle Mile district, where some people say the tunnels will be apt to fill up with the methane gas you can see bubbling up from the La Brea Tar Pits. That’s right, folks, it’s still very much there; in places you can see tar oozing up out of the sidewalk. They throw a shovelful of kitty litter on those spots every day so people don’t get stuck, sucked down like bewildered mammoths, and turn up in 20,000 years as blackened skeletons. Or maybe future archaeologists will excavate layers of BMWs, Mercedes-Benzs, and city buses, with the occasional bicyclist and skateboarder. Yesterday Lee was pretty sick, so I set out to do something I’d had in mind for a while, which was ride the Red Line from one end to the other and see every station. Sort of an orientation. 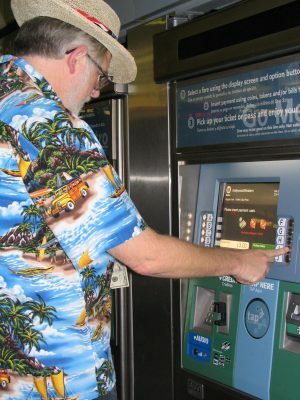 I did it with BART years ago, when it first opened. Why not here? 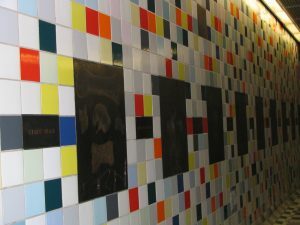 At the Hollywood and Vine station the entire ceiling is covered with movie film reels. 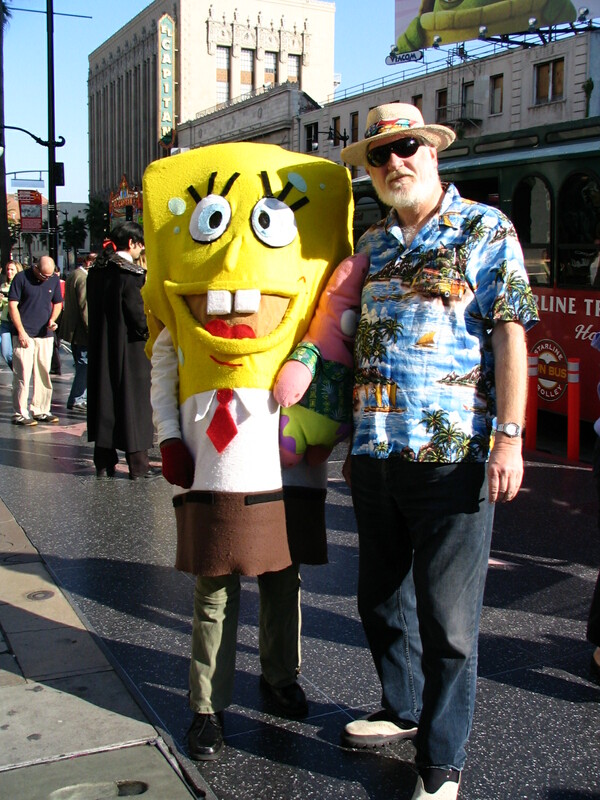 When you get to the surface, which is actually at Hollywood and Argyle, there is a movie marquee and a structure that suggests Grauman’s Chinese Theater (which is actually at Hollywood and Highland), a big Brown Derby (which is gone now), and a cartoonish fiberglass limo. The next station is the Hollywood & Highland Center. I can’t remember what used to be there, but now it’s a three-story upscale shopping colossus that is cleverly oriented so from the central mall the Hollywood sign in the hills in the distance is perfectly centered through an archway. The decor is retro-Intolerance, with two huge rearing elephants from the epic (and incomprehensible) D.W. Griffith film made not far from that corner in 1916. 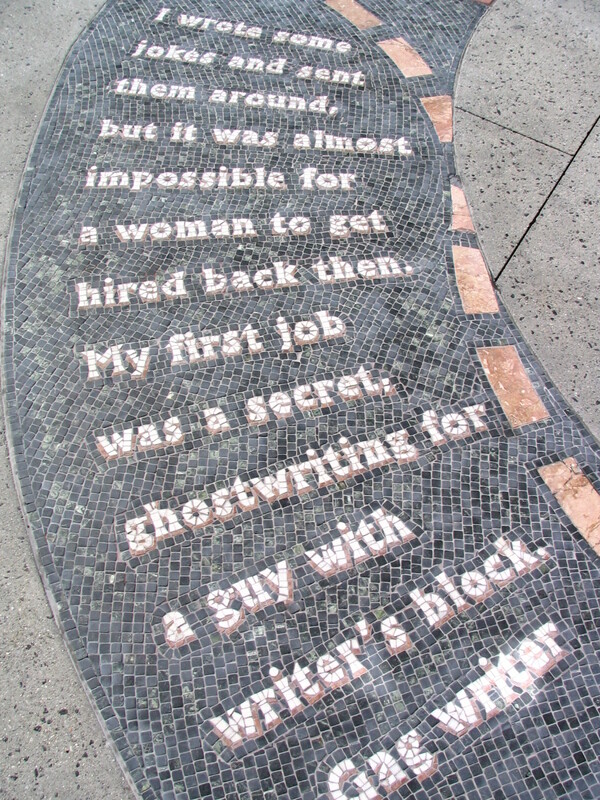 The sidewalks are decorated with mosaics of very funny quotes about Hollywood. Most of them are not from stars, but from the behind-the-scenes people: Anonymous Costume Designer, and so forth. 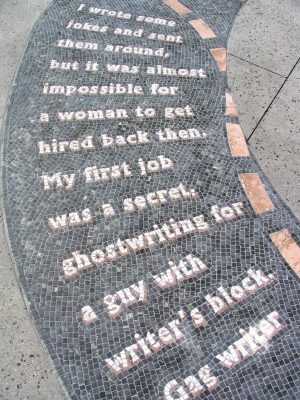 It’s worth spending some time following the snaking tiled paths and reading them. The HH Center contains a multiplex cinema and the Kodak Theater, new home of the Oscar award show. Right now and until a few days before the Academy Awards there is a display of fifty (count ’em, 50!) Oscars. I hadn’t realized the Academy or anyone had that many … but they do, though only temporarily. Turns out these are the statuettes that will be handed out, later to have the names engraved on them. They are in glass cases. But there are two others. One is the special award that will be given to Robert Altman for lifetime achievement. (And about time! Next year: Martin Scorsese.) The other is Clark Gable’s from It Happened One Night. I didn’t get to read the whole story about it, but it somehow came onto the market recently. At the auction an anonymous bidder bought it. 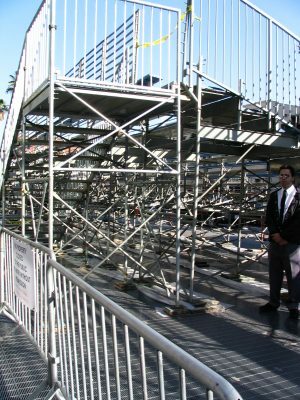 That turned out to be Steven Spielberg, who donated it to the Academy because he didn’t believe there should be traffic in Oscars. Nice one, Steve! 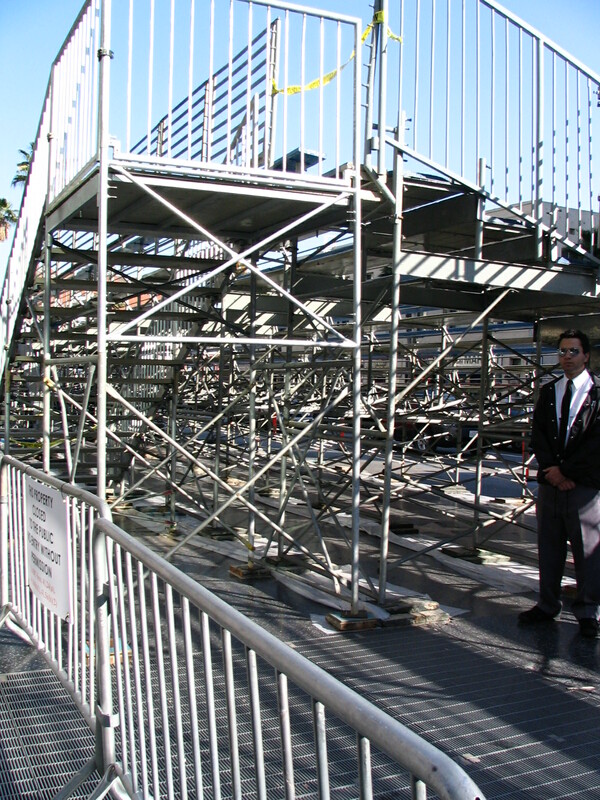 Outside, the sidewalk was partially blocked by a lot of steel barriers. I wondered why. Couldn’t be the Oscars, that’s still more than a week away, right? Turns out that’s exactly what’s going on. The Academy Awards is a very big deal by my new hometown. I drove by today and two big grandstands have been set up. There is a sign saying that the entire street will be closed at Highland starting Saturday, and for a whole week. What are they going to do, put red carpet over the whole block? Anyway, those barriers are seriously cramping the style of Superman, Batman, Spiderman, the Wookie, Princess Leia, Spongebob Squarepants, and all the other toons who gather on the Walk of the Stars every day to make a little dough getting their pictures taken with people from Japan. 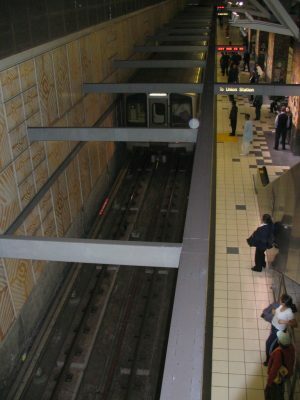 From there the subway plunges under the Cahuenga Pass and doesn’t come up for air again until Universal City. That’s a long ways, and it must be quite deep in places. It goes beneath the Hollywood Freeway and the Hollywood Bowl, and then lets you out right at the foot of what Harlan Ellison has called the Dark Tower. I think of it as the Black Monolith, myself. 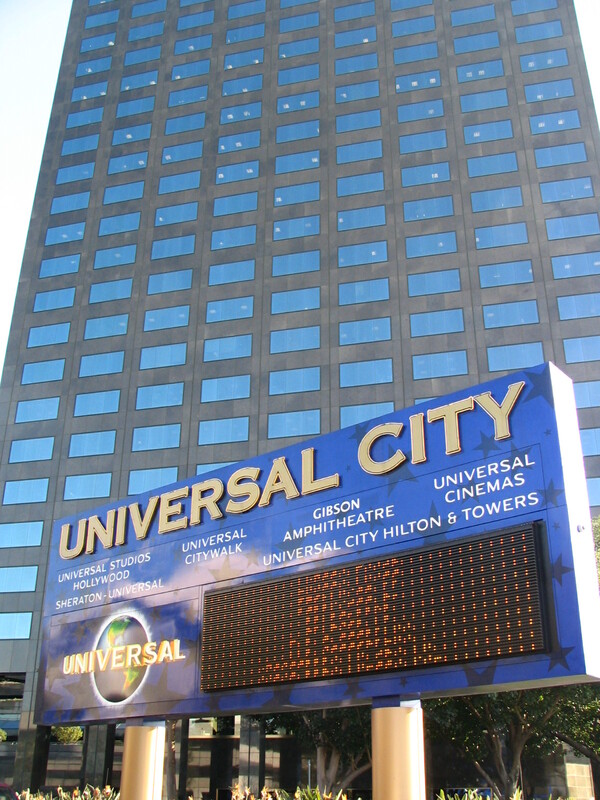 It’s the NBC/Universal Building. I crossed the street and what should I see there, hiding in the shadow of a parking structure, but a big van with Mickey Mouse painted on the side. What’s the mouse doing at Universal? Did he get lost on the way to Anaheim? Or is the whole park surrounded? Maybe Mickey and friends are getting ready to stage a coup against Universal City. I’d pay to see that. At the foot of the hill is a tram stop. You know, Universal has grown from a simple studio backlot tour to a major theme park, but one thing hasn’t changed, and that’s the trams. It’s still the same little angular cars they used to show in theaters across the nation at the end of Universal pictures: “When in Southern California, visit Universal Studios!” This was back in the 1960s. Well, I couldn’t help myself. I got on board and we pootled up the hill and were let out at the entrance to the Universal City Walk. This is the free area of shops, shows, and restaurants leading to the theme park. It was so successful that Disney imitated it when they built California Adventure in the old parking lot at Disneyland, putting Downtown Disney between the two parks. (As usual, Disney did it better.) It’s an interesting stroll, full of bright colors and neon and sound with no two buildings in the same architectural style. I visited a magnet shop to add to our collection. They had thousands upon thousands of magnets, including some of Mickey Mouse and other Disney characters … and not one magnet for Universal Studios! I couldn’t believe it. I finally found one in a Universal-only souvenir shop right by the theme park entrance. The entrance was a bit of a puzzle. They sold something called “All-you-can-eat!” for $19.95, which apparently entitled you to unlimited pop, fries, and dogs. They also advertised a “Head of the line” pass for $99, which allowed you to cut in at all the rides. Somehow that seems mean to me … but I admit, if I could afford it that’s how I’d go. But nowhere did it list the general admission price. I had to go online just now to find that it costs $56. There were a lot of expensive restaurants, the kind that posts menus outside but no prices. Then there were more reasonable places. I settled on a booth selling Cuban food, which I know little about, with the quintessentially Cuban name of … Versailles. What’s the story on that? Did a French fast food place go bust and the new owners just kept the sign? Isn’t “French fast food” a contradiction in terms? (Other than the ubiquitous French fry, of course.) Anyway, I order the Cuban Special plate, which turned out to be a fried beef tamale, fried pork, fried plantains, something that looked like two fried fish sticks, and a slice of raw onion. Sounds like the sort of meal where they should just serve you a cup of grease and get it over with, right? But it wasn’t greasy at all. It was all crisp, tasty and quite good, especially the fish sticks, which turned out to be “ham croquettes.” I ate outside on a patio with the Incredible Hulk bursting through the side of a building across the way, looking like he wanted to rip my guts out, or at least steal my fried plantains. He was about three stories high, green, made Arnold the Guv look like a girly-man, and his head was about the size of my own. I don’t mean in relation to his body, I mean literally. The guy’s head was tiny. Back on the subway, next and last stop is North Hollywood. The station is very nice. There are tiled murals of the history of California. On one side of a wall will be the pictures with text in English, and on the other side the same with Spanish text. As you go up the escalator you see scenes of the history of the San Fernando Valley. As I recall, pick-up trucks and tract housing were prominent. At the top, you see … well, North Hollywood. What can I say? I understand there are areas that are nice, but this isn’t one of them. I was handed a hair-raising tract called “The Beast.” Yikes! Watch it, y’all. Satan is comin’, so get ready for The Rapture. The end of the line connects with something I hadn’t seen before: The Orange Line, which isn’t a train but a dedicated busway that goes to the Bob Hope/Burbank Airport and all the way out to the Warner Center in Woodland Hills. It was built over an existing railroad right-of-way, and it combines the best features of bus and rail travel. That is, no other vehicles run on the street and when it crosses a road it’s like a railroad grade crossing, all the cars have to stop. Sounds good; we’ll have to give it a try the next time we want to go to see something in the Valley. … yeah, right. Well, all the stations have artwork, like Portland’s MAX trains, so we could go see those, okay? I decided to ride from one end to the other, and I timed it. Exactly 28 minutes from North Hollywood to Union Station downtown. You might be able to do that in a car … at, say, 3 in the morning. But not during the day, when the Hollywood Freeway is a parking lot much of the time. So I rode back to the Civic Center Station and went above again. Much of downtown Los Angeles is, frankly, a sterile, ugly place. Getting off on Hill Street at the Civic Center drops you off into urban monotony. Not far away is the Disney Concert Hall, but you can’t see it from here. A bit beyond that is the old Dorothy Chandler Pavilion and performance center, and beyond that is Chinatown and Olvera Street, but those are better reached from Union Station. There’s not much here at all. So I walked down a block to Broadway, where what real life remains in downtown is to be found. A few blocks took me to the Bradbury Building, where I just had to drop in for a moment and gawk. It’s probably the best remaining structure from the old days. Not much from the outside, but inside it’s a fairy castle of wrought iron balconies and two old cage elevators, with a huge skylight above. Now that they’ve torn down the old Ambassador Hotel (can you believe it? ), the Bradbury is probably the #1 movie location in LA. You’ve seen it in many films, most famously in Blade Runner, but it also featured in films as varied as Good Neighbor Sam with Jack Lemmon (a film set in San Francisco) and Wolf, with Jack Nicholson (set in New York City!). From there downtown Los Angeles turns into Tijuana, or Mexico City. Predominantly Hispanic, slightly seedy, full of bargain shops and cheap jewelers. The remains of half a dozen or more of the grand old theaters are still there on Broadway, complete with fancy marquees, and I’ve got to get Lee down there soon to photograph them before somebody decides to tear them all down. Not a one of them still shows movies. I was in search of Angels Flight, the one-block funicular that claims to be the shortest railway in the world. But I couldn’t remember where it was. And frankly, I was getting pretty bushed. (Arthritis in the knees and, increasingly, the hips.) I’d been walking a lot of the day. So I spotted the Grand Central Market across the street and decided to take a look, then get back on the subway. This is one of those wonderful places like the Pike Place in Seattle or the Hollywood Farmers Market in the Fairfax district here in LA. Lots of mouth-watering produce, butchers, fishmongers, sawdust on the floors, little diner operations, going on and on and on. And I saw it went right through the block to Hill Street, so after looking around a bit I came out there and found … Angels Flight! This landmark was built in 1901 and it cost a penny to ride it up one very steep block. Many Angelenos have loved it, and others have tried many ways to kill it. I read a few of the posted signs and it seems Angels Flight has been out of service more often than it has actually run. They were going to destroy it entirely in 1959 in the name of urban renewal, but the citizens rallied and … well, didn’t save it, but had it dismantled and stored until 1996! Then it was rebuilt half a block from the original location. Now it goes up to the extremely sterile but very profitable Bunker Hill, the skyscraper district that replaced the decaying old mansions that used to be there. … only, today, it once more isn’t going anywhere. In 2001 a cable snapped and a car rushed down the hill and killed an old man, and it’s been shut down ever since. But the signs say it should be re-opening this spring. It sure looks like everything is ready, with a fresh coat of paint, but no cars in place yet. So I walked on to the next station, Pershing Square, looked around, didn’t see anything resembling a square, and boarded the next train. It was a little after 4 PM. I found a seat and at the next station, which was the transfer point for the Blue Line to Long Beach, the car filled up with people. My feet, legs, and hips were killing me, so I decided to skip seeing the rest of the stations and neighborhoods, keep my seat, and save the rest for another day.